A beekeeper continues to collect beehive containers scattered along I-95 near Newark, Delaware Wednesday. 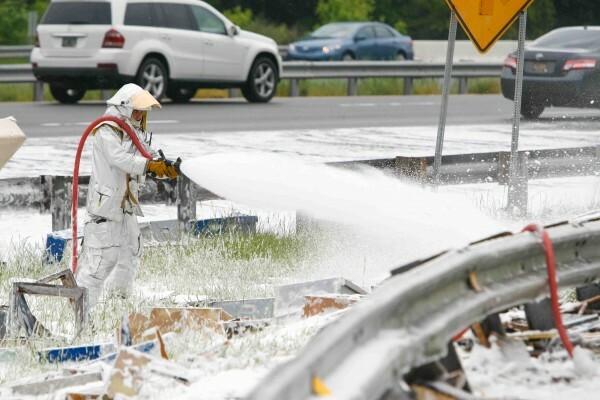 Dominic Pizzo with Station 33 Delaware Air Guard uses foam to spray on the millions of bees along I-95 near Newark, Delaware, on Wednesday. 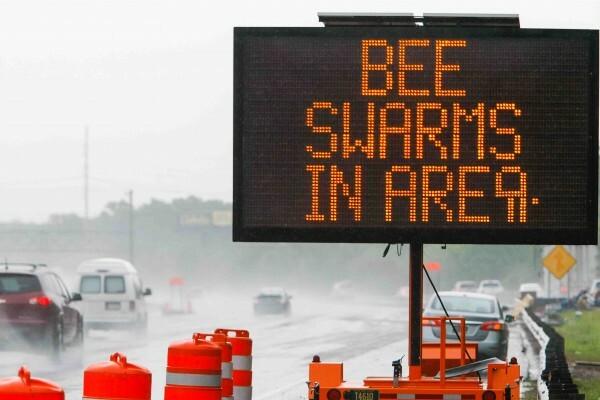 Traffic along I-95 are met with a warning sign from Delaware Department of Transportation to keep their car windows closed due to swarming bees near Newark, Delaware, on Wednesday. The tractor-trailer overturned about 6:10 p.m. Tuesday on the Del. 896 on-ramp to northbound I-95 at the outskirts of Newark, Delaware. 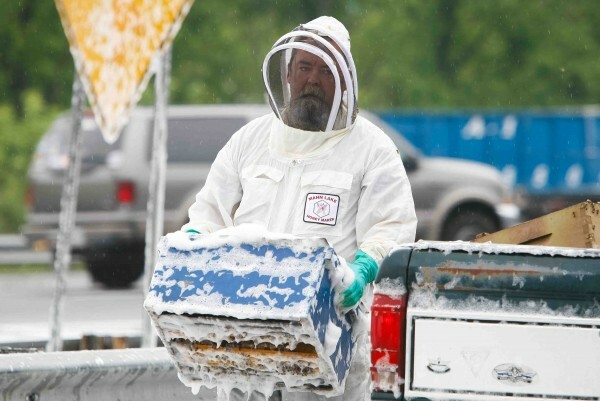 ELLSWORTH, Maine — A truck hauling millions of honeybees north to blueberry barrens owned by Ellsworth-based Allen’s Blueberry Freezer Inc. overturned and unleashed the swarm on Interstate 95 in Delaware Tuesday evening, according to Maine’s state apiarist. Officials from Allen’s declined to comment Wednesday afternoon about the loss of the honey bees. The 460 hives traveling from Florida to Maine carried about 16 million to 20 million honeybees, part of a migrant labor workforce of bees that pollinate crops all across the country. 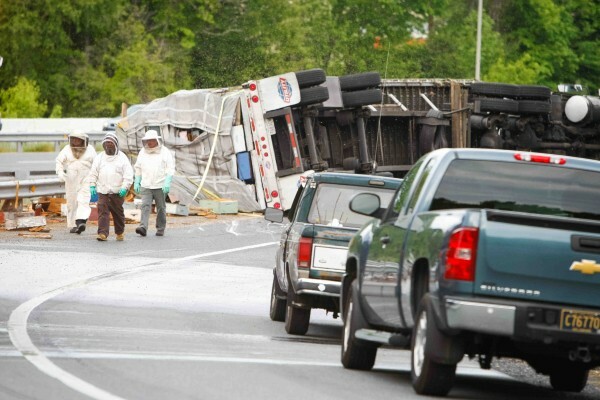 The truck overturned onto its side at about 6:10 p.m. Tuesday, according to a report in The News Journal, a Delaware newspaper, and traffic was diverted for hours after the accident because the swarm was so large that police couldn’t get close to the truck. The truck driver and his two passengers were taken to the hospital after the accident and being stung multiple times by bees, according to the newspaper. A Delaware state police official said that his agency had a plan in place to activate in case of an emergency bee swarm. As per the plan, police got ahold of beekeepers, who told emergency responders to hose down the swarm. According to The News Journal, state police cited the driver, Adolpho Guerra, 55, of Miami, Florida, with having an unsafe load. Guerra suffered 50-100 bee stings. Jadczak said that about half of the bees from the accident have been salvaged, and officials are trying to sort out whether to return them to Florida or have them continue to Maine. In Maine, where about 80,000 hives will be shipped this year, the state apiarist said most of the migrant honeybees are destined for the blueberry barrens in Washington and Hancock counties. The first netted flatbed trucks filled with beehives came at the end of April and more are continuing to arrive. Several thousand hives also will be distributed in the apple and blueberry regions located in the southern and central regions of the state, he said. After the blueberries bloom, most of the bees will be on the move again to points west and south. Some hives will be sent up to Aroostook County in mid-June, where the bees will remain until the fall migration back to southern states. Jadczak said that the blueberries are just starting to come into bloom in the central Maine area. He expects that the bloom will start next week in downeast Maine. While recent mild winters have caused early blooms for the crop, this year’s timeline is similar to how it used to happen in the 1980s and 1990s. “Things are normal, the way they used to be,” Jadczak said. According to a 2012 BDN report on the practice of renting hives, Maine has 60,000 acres of blueberry barrens, with about half of those acres in production in any given growing season because of the crop’s two-year cultivation cycle. Frank Drummond, a blueberry pollination expert, told the BDN that the cost of renting hives can be a blueberry grower’s single most expensive management practice, but that the practice results in higher yields. At that time, growers paid rental fees of between $90 and $100 per hive, a sharp increase from the $60 or so it had been a few years prior. Higher transportation costs and smaller bee populations caused by colony collapse disorder were responsible for the price hike, a University of Maine Cooperative Extension Service blueberry specialist told the BDN.